← Detroit, Michigan. January 20th, 2014. 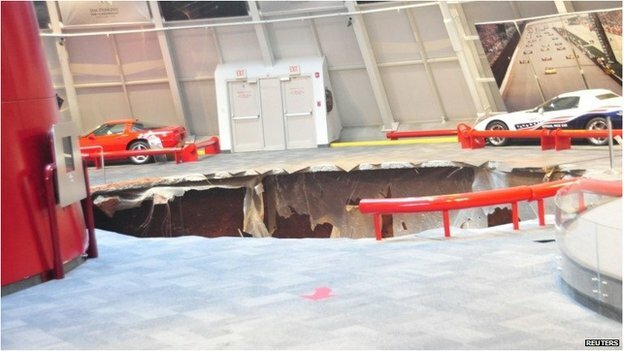 A 40-foot sinkhole opened up under the National Corvette Museum in Kentucky and swallowed eight collector cars, including a black 1962 model, the museum said on Wednesday. No injuries were reported, but a 1993 ZR-1 Spyder and a 2009 ZR1 “Blue Devil” on loan from General Motors Co were among the iconic cars piled up in the pit. “It is with heavy hearts that we report that eight Corvettes were affected by this incident,” the museum, based in Bowling Green, said in a statement. Alarms went off early Wednesday morning in the “Skydome” area and museum security officers who rushed to the scene found the sinkhole, 25 to 30 feet deep. The Bowling Green Fire Department estimated the sinkhole at 40 feet wide. No one was in or around the museum during the collapse happened. In addition to the 1962 Black Corvette, a 1984 PPG Pace Car, a 1992 White 1 Millionth Corvette, a 1993 Ruby Red 40th Anniversary Corvette, a 2001 Mallett Hammer Z06 Corvette and a 2009 White 1.5 Millionth Corvette, were among the damaged cars owned by the museum. The museum will be closed, while a structural engineer assesses the damage and stability of the surrounding area, the museum said. GM builds Corvettes at a plant in Bowling Green across the street from the museum, which opened in 1994. Buyers of new Corvettes can arrange to take delivery of their car at the museum. 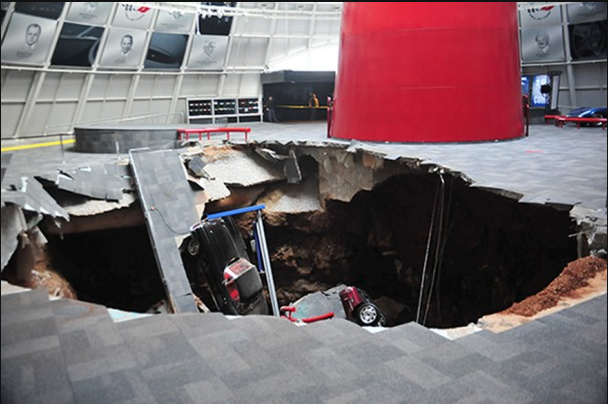 This entry was posted in Pictures, Vehicle v Sinkhole, Videos and tagged Corvette, National Corvette Museum in Kentucky, sinkhole. Bookmark the permalink.